Your going to take your bell cookie cutter and cut a bell shape out of 1 slice of bread. This will leave s very small tiny amount of bread all the way around. I used the leftover on this to cut the little Bible out. I used the corner of the bread and pressed the present cookie cutter into the side of the corner of the bread to get what you see above. It is almost square but not really. I just didn't want to waste bread. Take your peanut butter and smear it all over the bell shaped bread cutout and square bread cutout. Turn your bell upside down and it will look like an acorn. You are going to take some crushed nuts of any kind and just sprinkle it on the bottom of the bell. But this will actually be the top... Add 2 large pieces of crushed nuts for the eyes and mouth. Take a black frosting writer pen and write the word BIBLE on the small square you cut out. 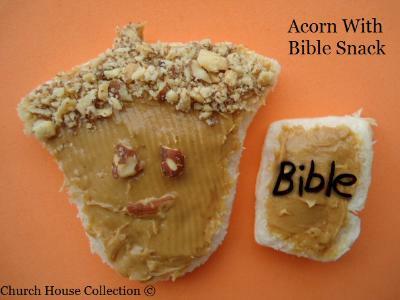 Use this fun little snack to go along with our Acorn Lesson Plan. These would make great fall snacks for the kids in Children's church.